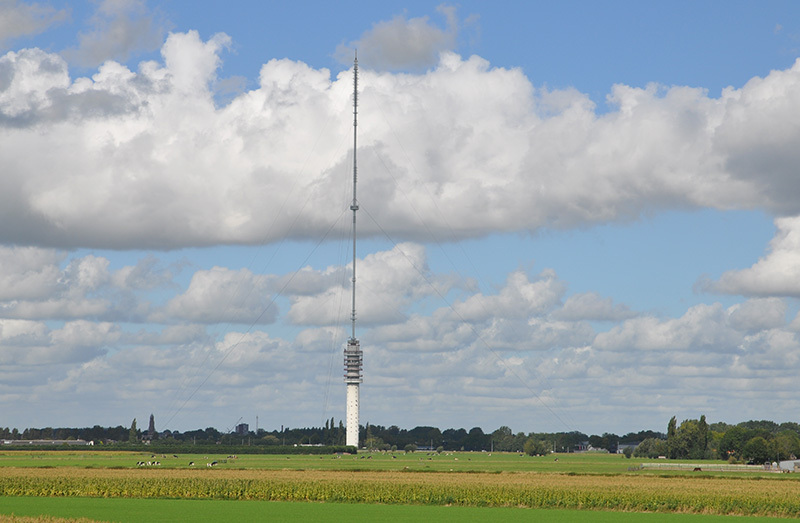 PC met software voor digitale modes: FLdigi, WSJT-X (versie 2), MixW (versie 3). De opzet is zodanig dat je voor kortere of langere tijd kan deelnemen, aan een of meerdere onderdelen. Een deel van de informatie zal ook op de website a22.veron.nl worden gepubliceerd. Een ander deel met de details van de oefening is alleen bedoeld voor de deelnemers. 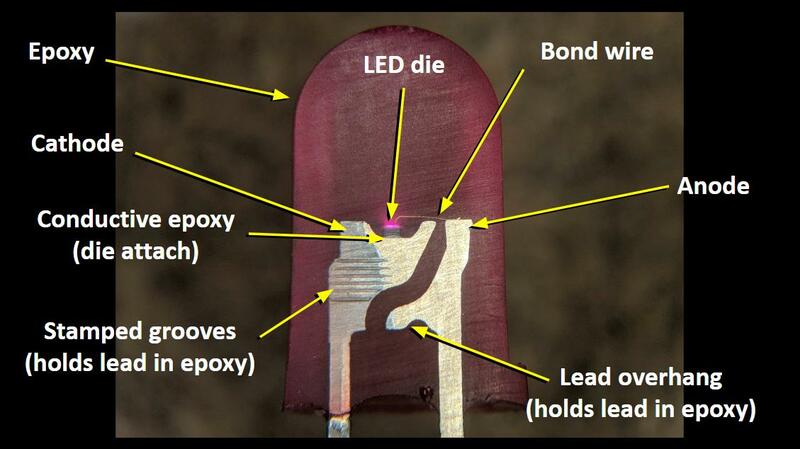 LED cross section — now with annotations! 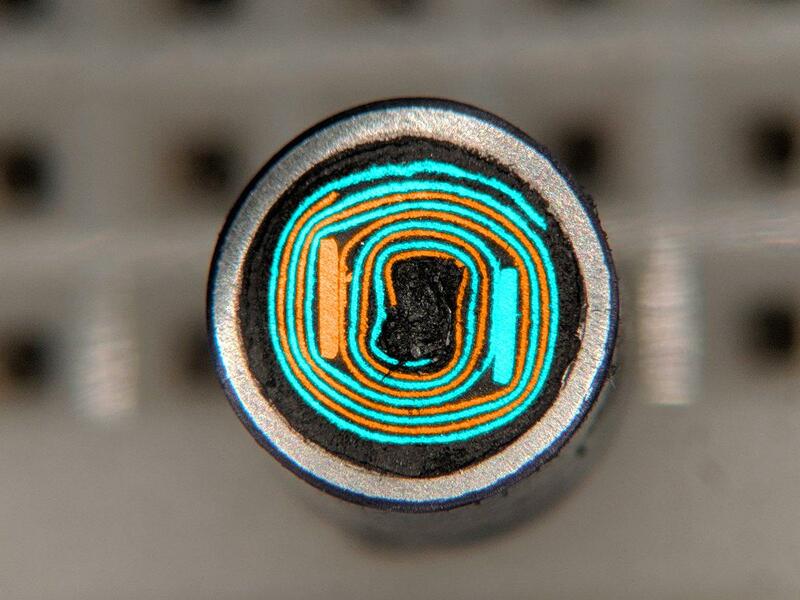 here’s a cross section of a resistor! and here it is with labels on the important bits. 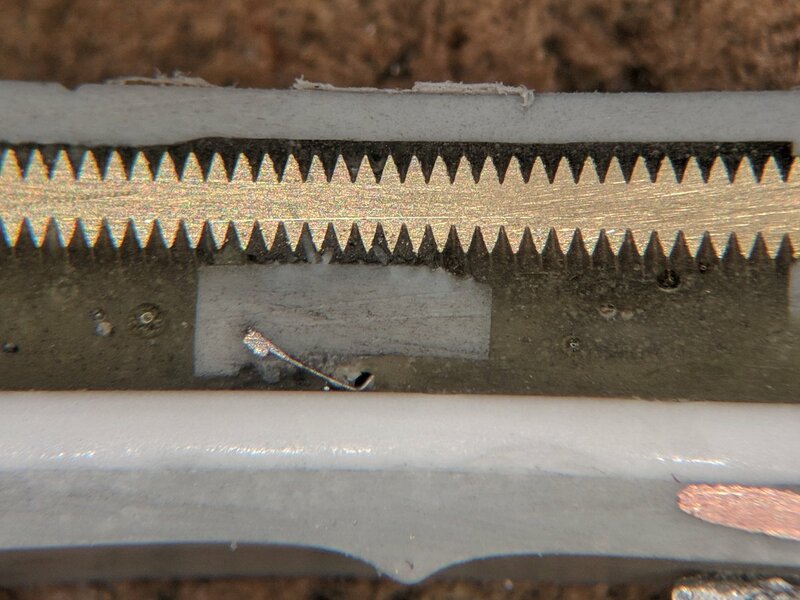 you can see part of the spiral gouge left by the trimming equipment. during manufacture, this machine removes carbon film, increasing the resistance until it hits the target value. 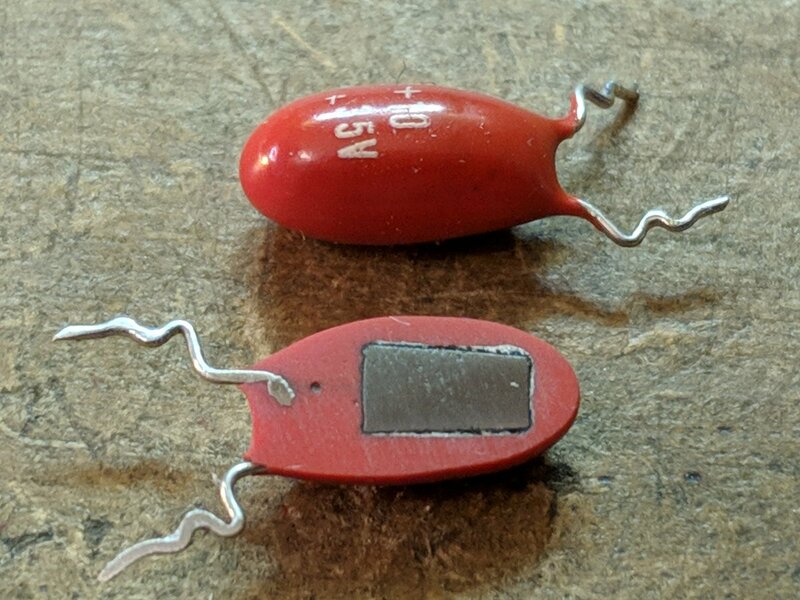 compare that with this old-school carbon composition resistor. 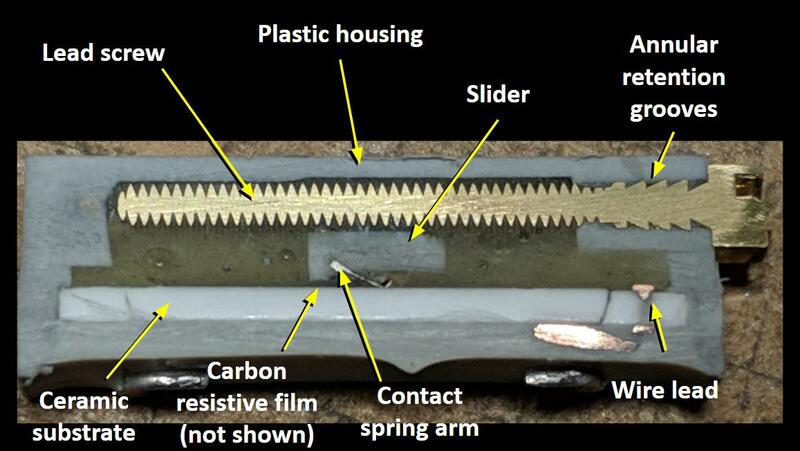 it’s just carbon powder inside a phenolic tube. 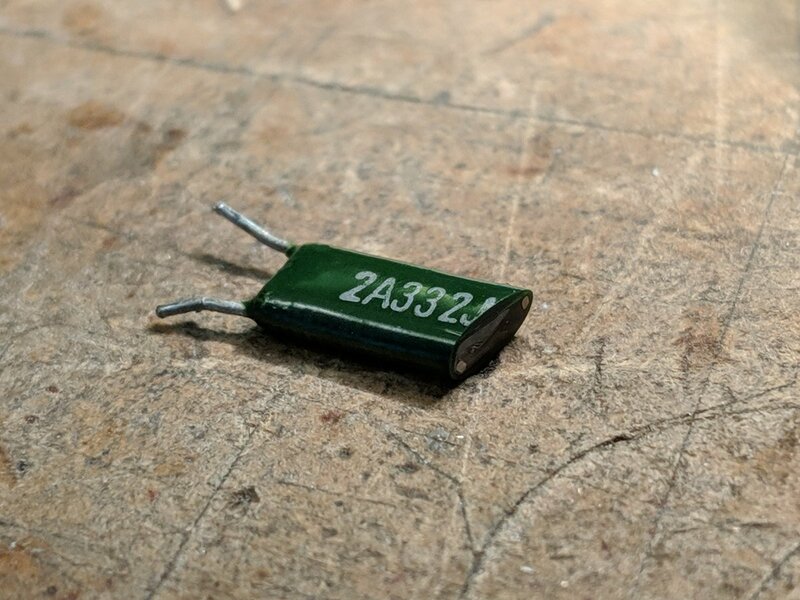 this carbon composition resistor has a value of 7.5 ohms. doesn’t take much carbon to get that resistance! 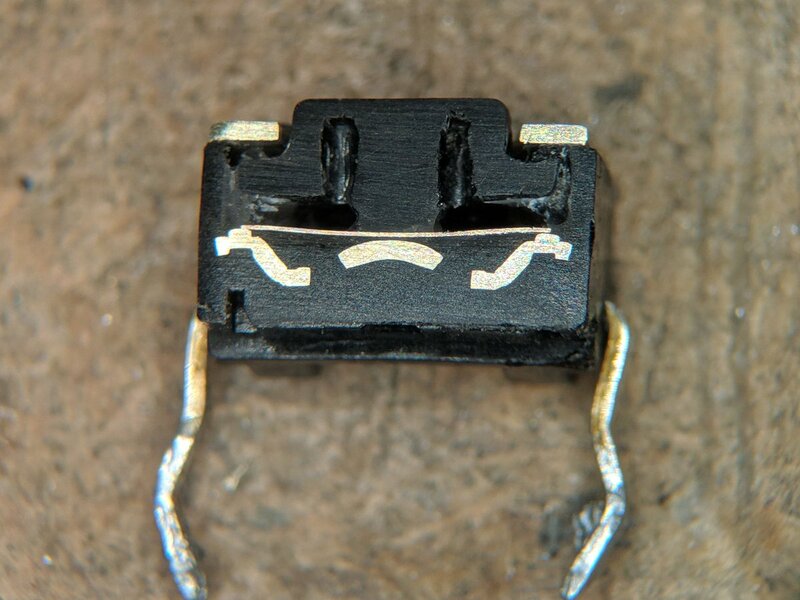 here’s the cross section of a diode! 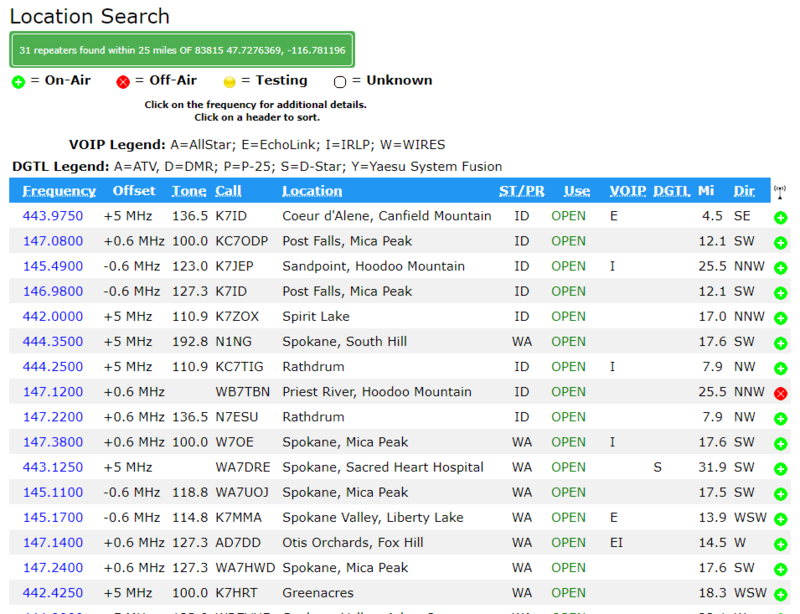 it’s a 1N4007. 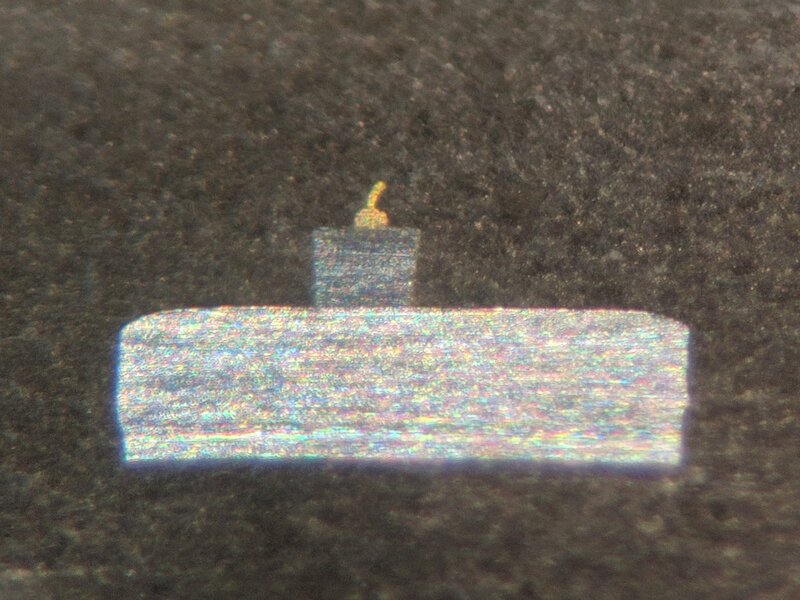 you can see the piece of silicon in the middle. the lumps on the wires help hold them in the plastic case. 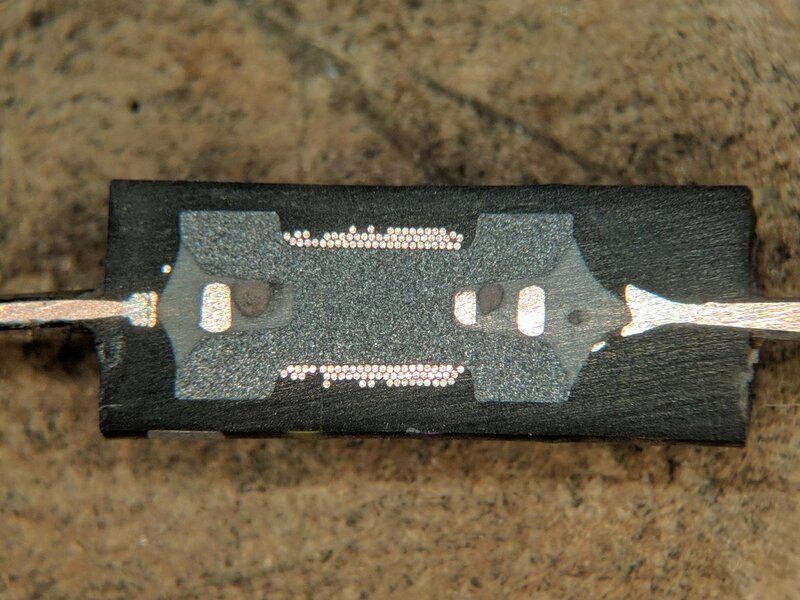 here’s a cross section of a surface mount ceramic chip capacitor. here’s the annotated version. i’ve drawn in lines over 4 of the capacitor plates near the bottom to make them a bit more clear. 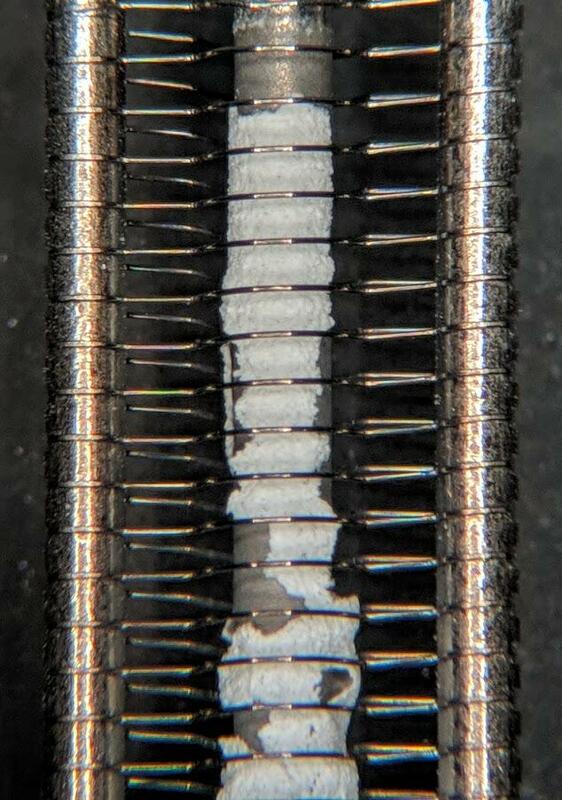 cross section of a film capacitor. 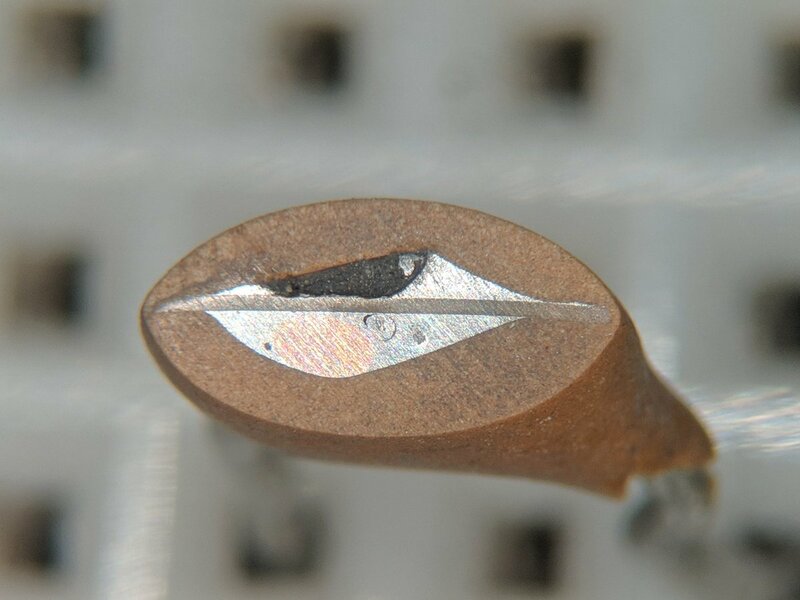 cross section of a ceramic disc capacitor. you can see the ceramic disc right across the center. 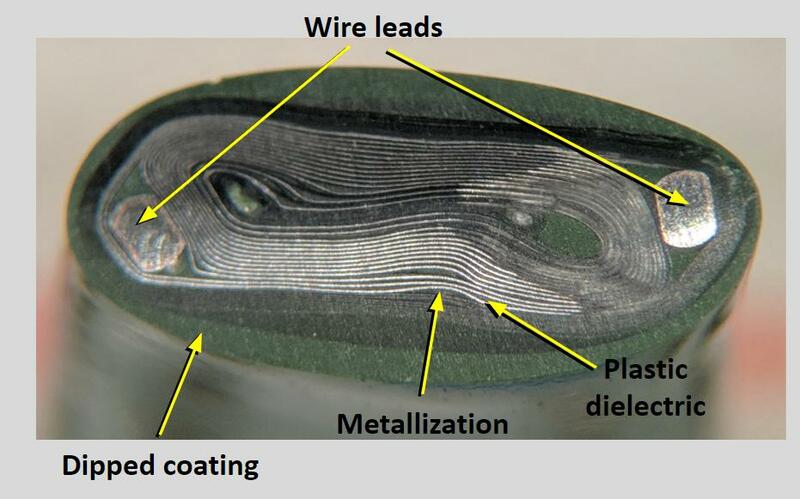 check out this cross section of an inductor! 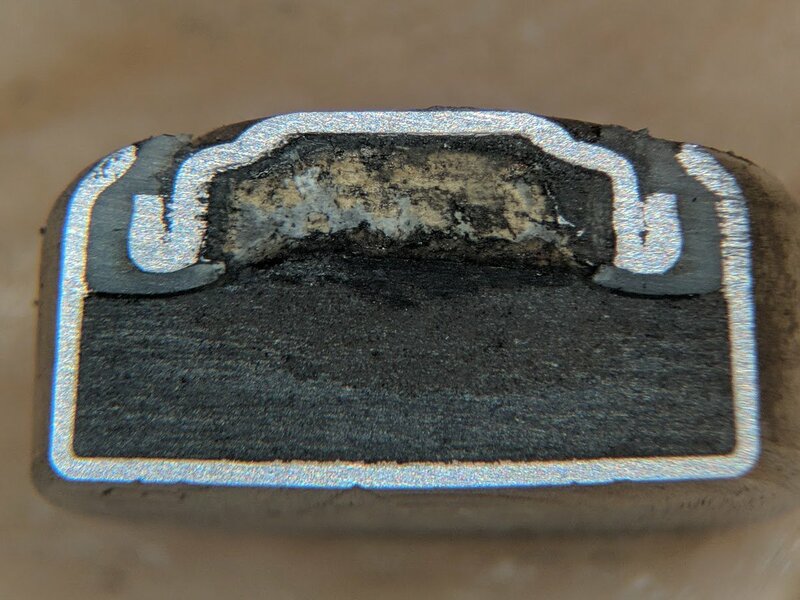 annotated version of the inductor cross section. 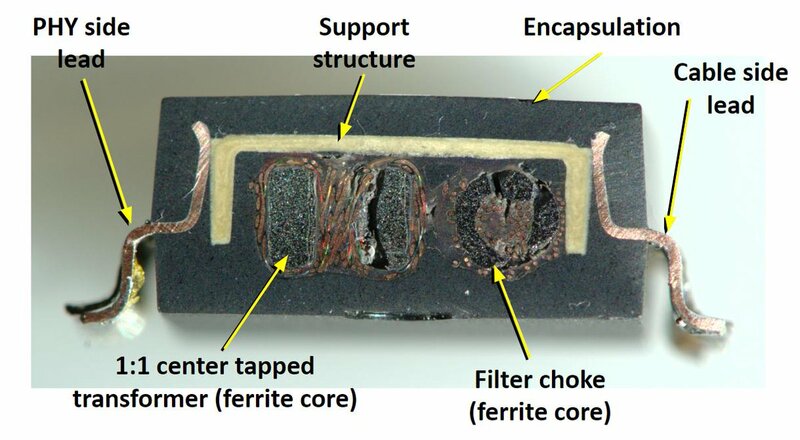 annotated cross section of a film capacitor. 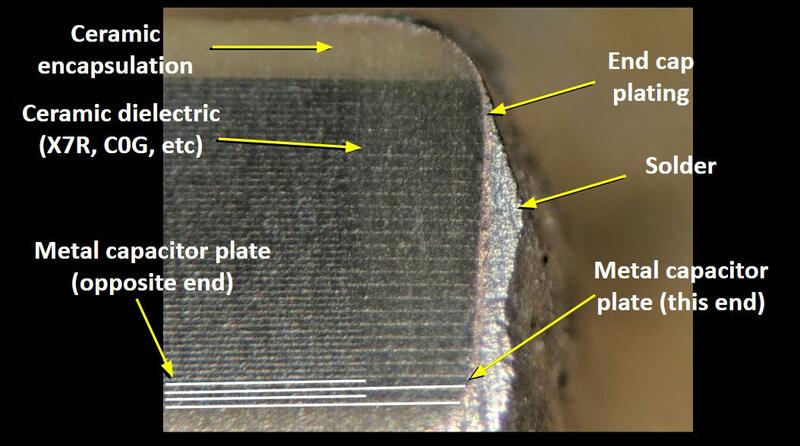 cross section of an electrolytic capacitor! i’ll annotate it shortly. adjusted the annotations to correct a mistake. 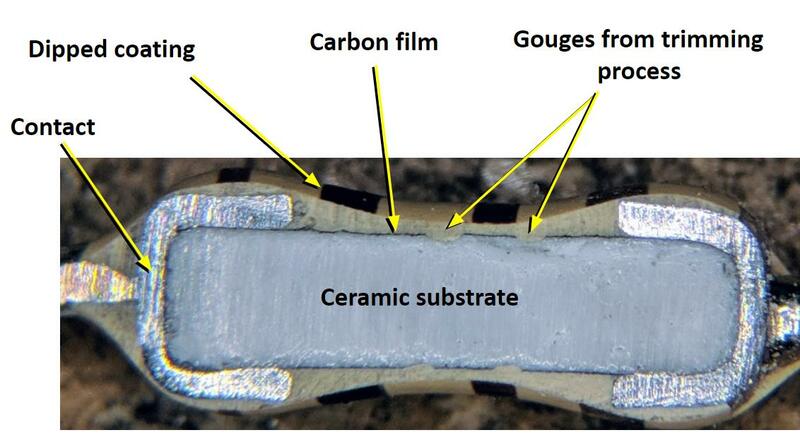 the paper in between the layers of foil is not actually the dielectric! 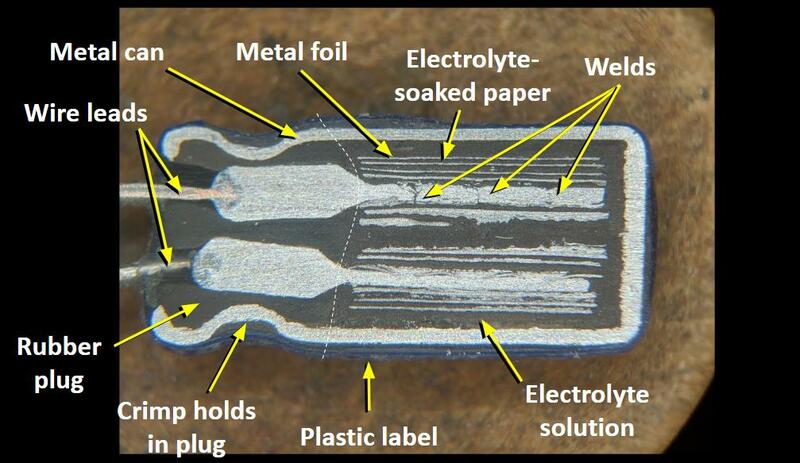 when soaked in electrolyte, it serves as the cathode (‘-‘ terminal). 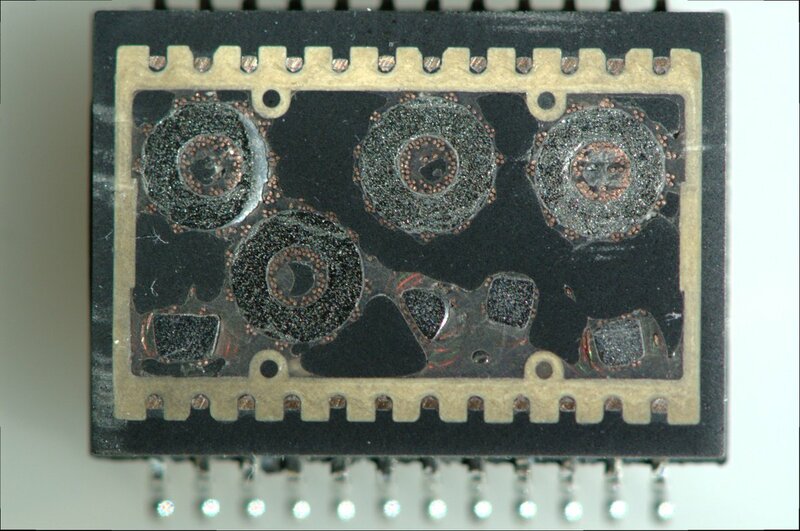 the dielectric is an oxide layer grown on the anode (‘+’ terminal). 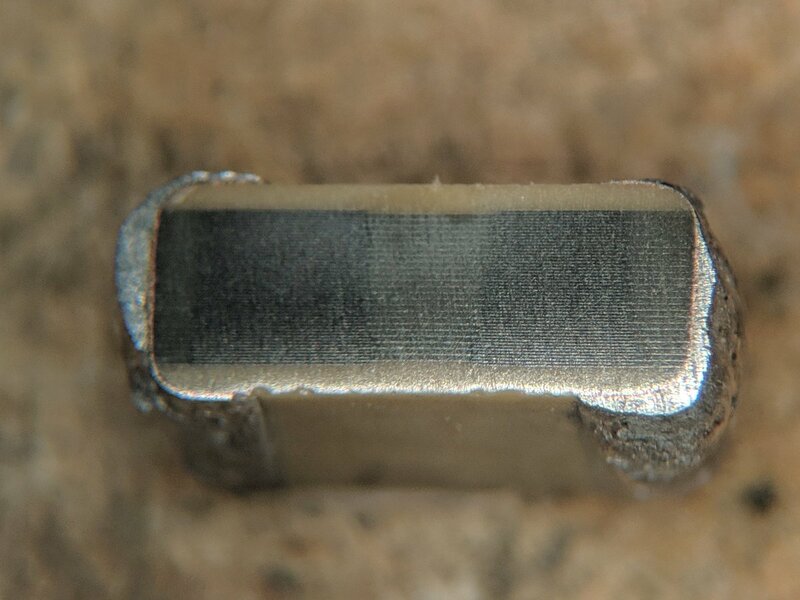 top view cross section of an electrolytic capacitor. Here’s a version with each plate colored in to make it easier to trace how they’re wrapped around each other. 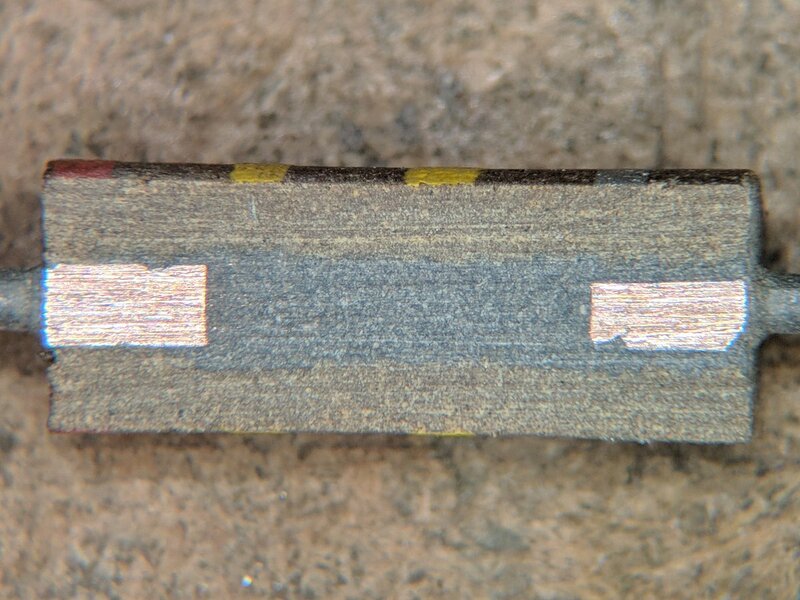 here’s the cross section of a dipped tantalum capacitor. close-up of the slider. 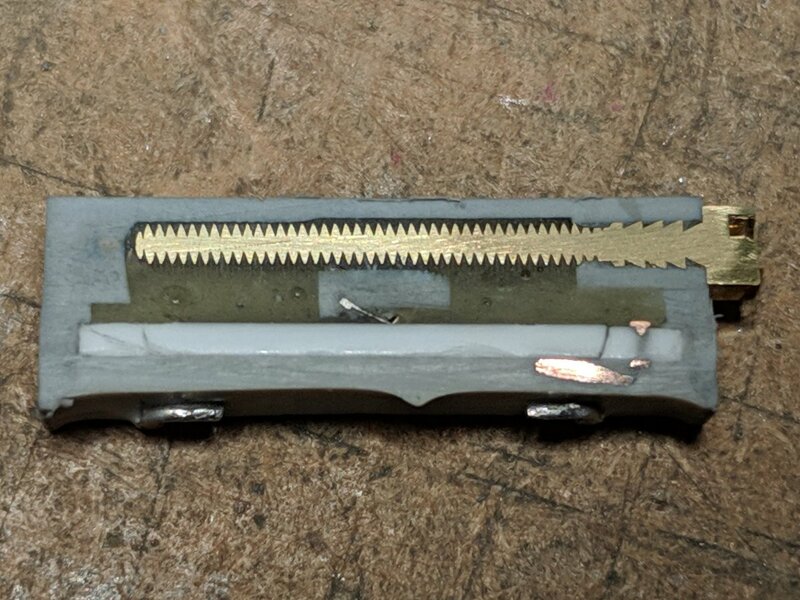 this part moves left and right as you turn the adjustment screws. annotated version of the 15-turn trimmer potentiometer cross section. 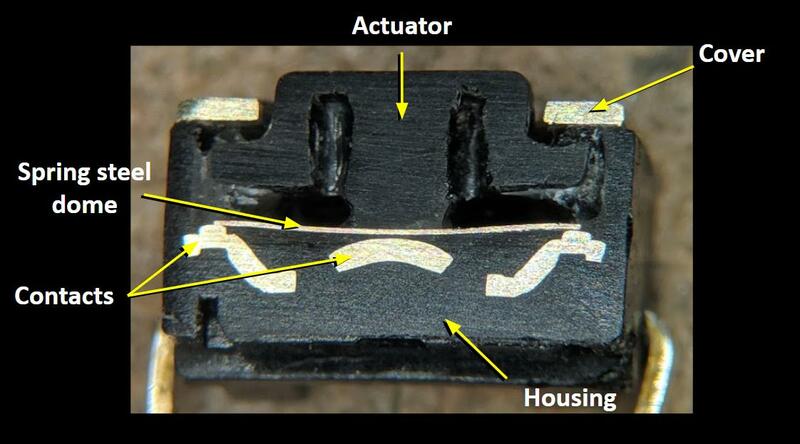 have a look at this cross section of a tact switch! annotated diagram of a tact switch cross section. in the photo, the button is pushed down and the dome is shorting the center contact to the outside contacts. 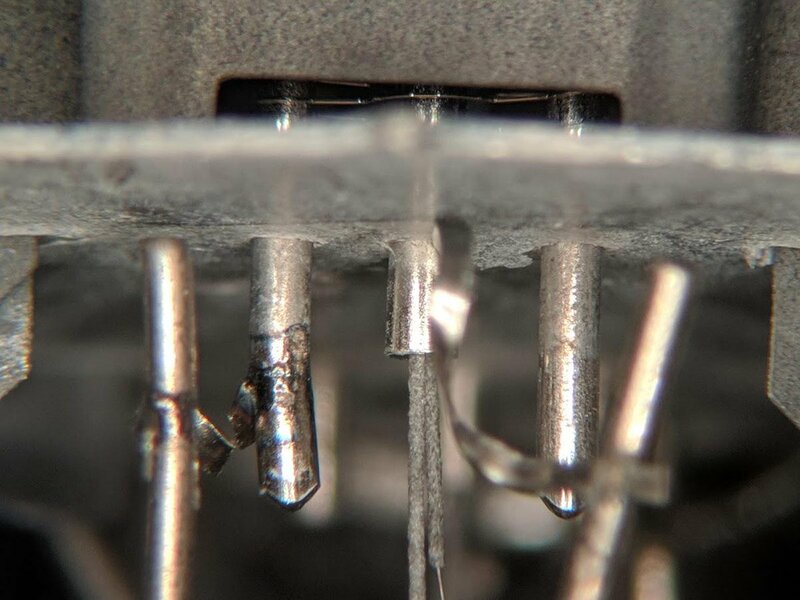 when you let go, the metal dome snaps up, making a tiny click and breaking the circuit. 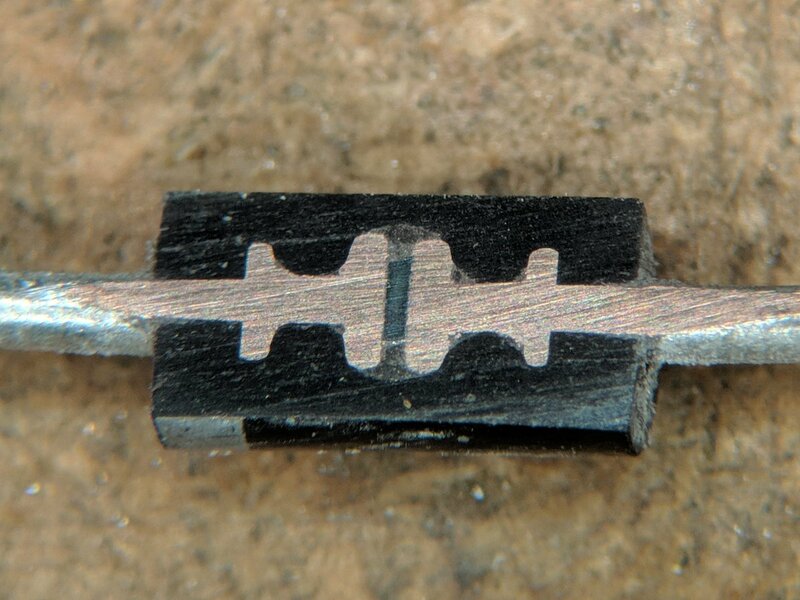 ok this is the cross section of a 2N3904 NPN transistor. what’s that tiny little speck? 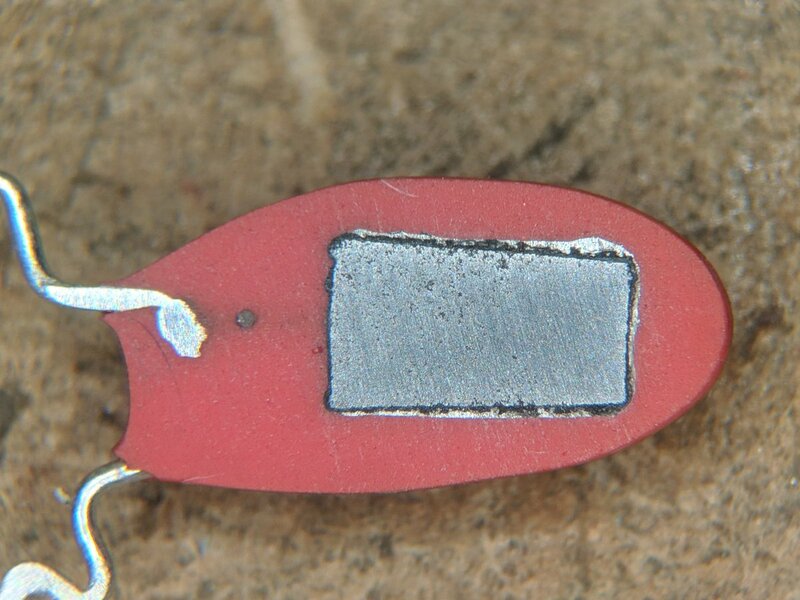 it’s the transistor silicon die! the little gold dollop on top is the emitter bond wire! the big metal slug underneath is the collector terminal. 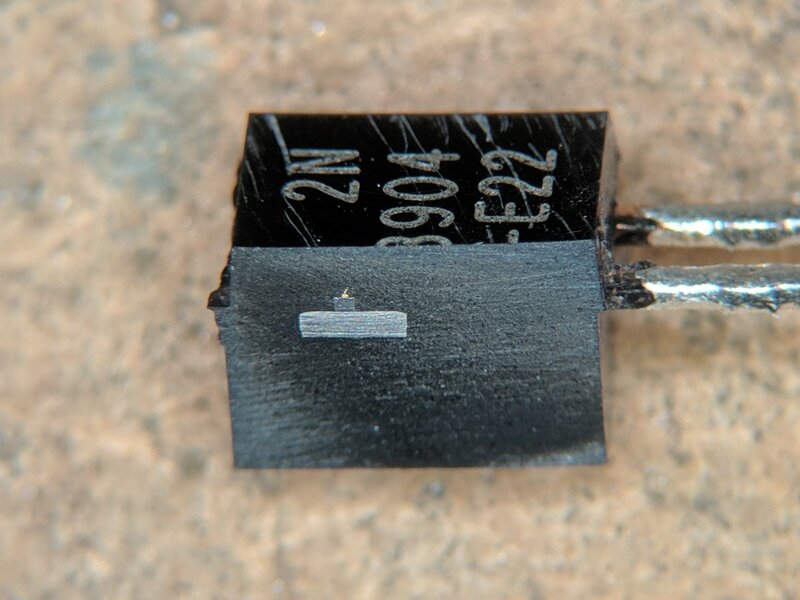 annotated version of 2N3904 NPN transistor cross section. 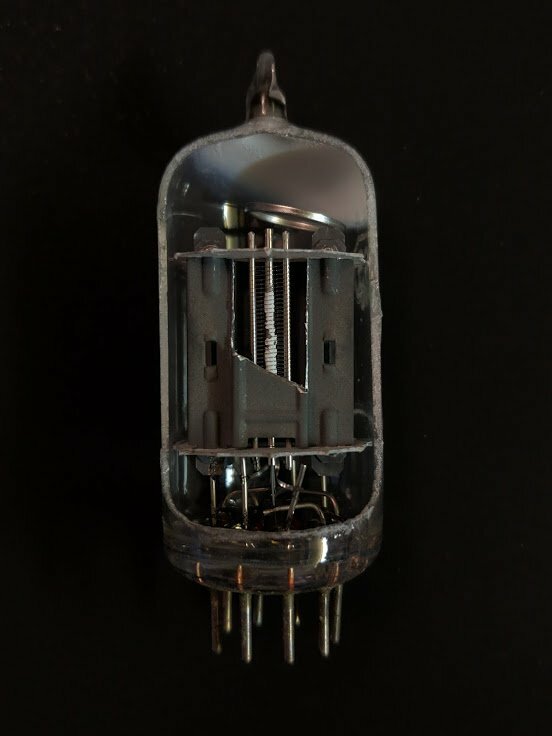 here’s a cutaway view of a classic 12AX7 vacuum tube triode. discriminating musicians use these tubes in their guitar amplifiers — you’ve definitely heard the sound before! 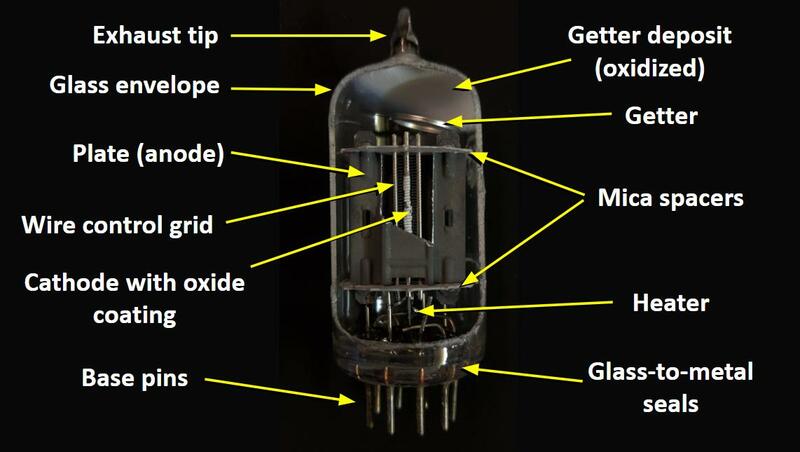 this is the annotated cutaway diagram of the 12AX7 vacuum tube. 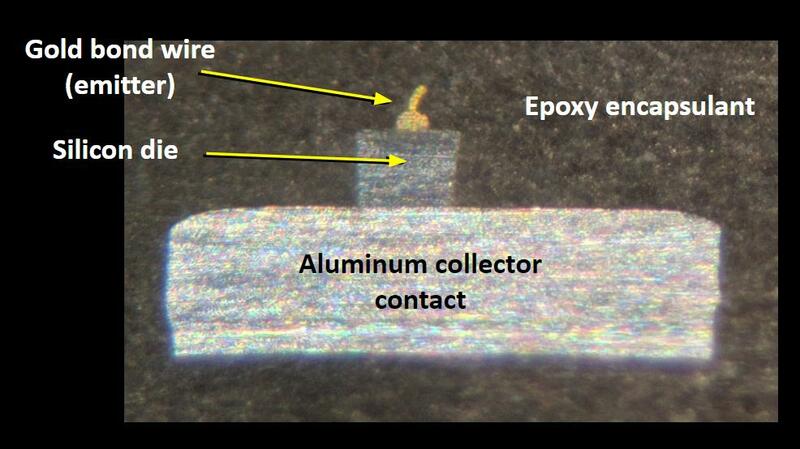 in the middle of this photo, you can see the coated filament wires entering the hollow cathode. 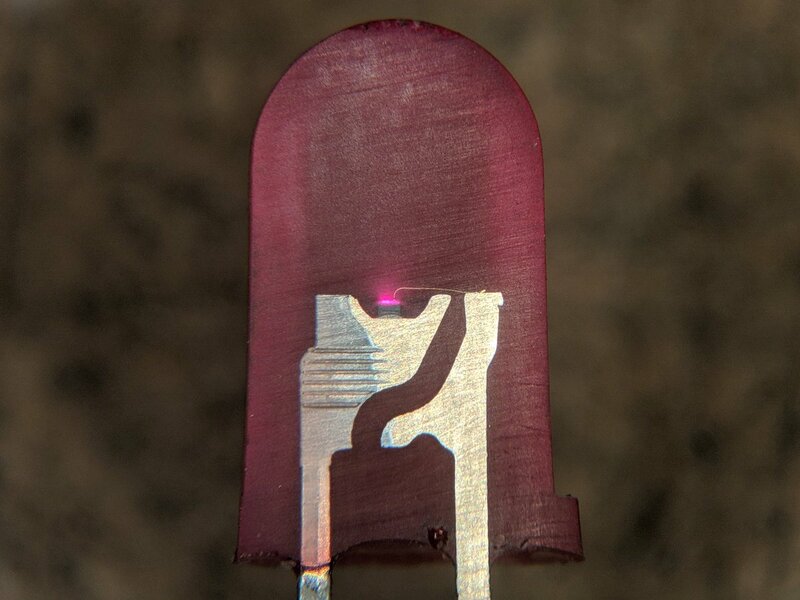 the filament heats up the cathode. 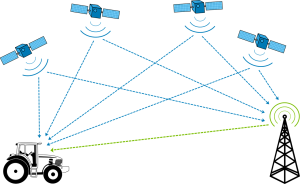 this produces an aura of electrons called the “space charge” region. 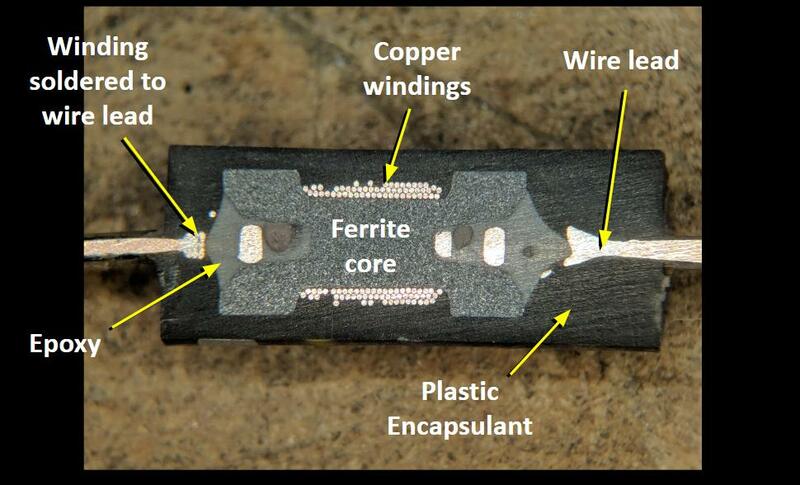 how about a closeup of the grid wires and the cathode? the white powder is oxides of barium, strontium, and calcium, which improves electron emission. the control grid, if biased negative, repels the electrons, caging them up. otherwise they pass through the grid to the plate. 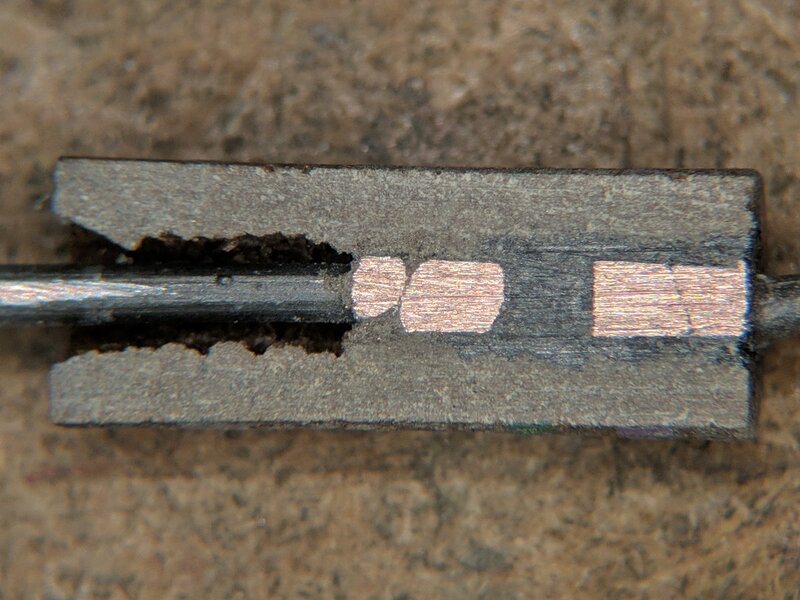 here’s a cross section of an Ethernet transformer. 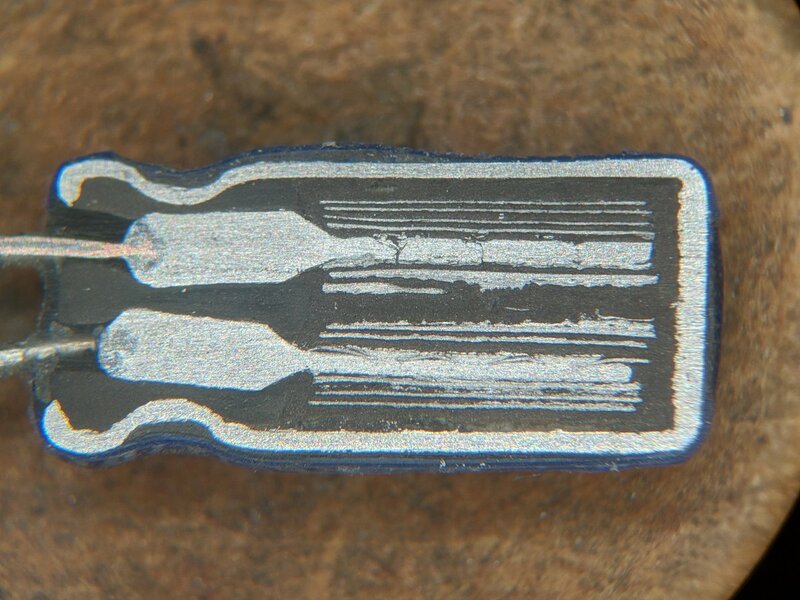 inside a network adapter, there is one of these in between the Ethernet PHY chip and the cable, providing isolation and safety. 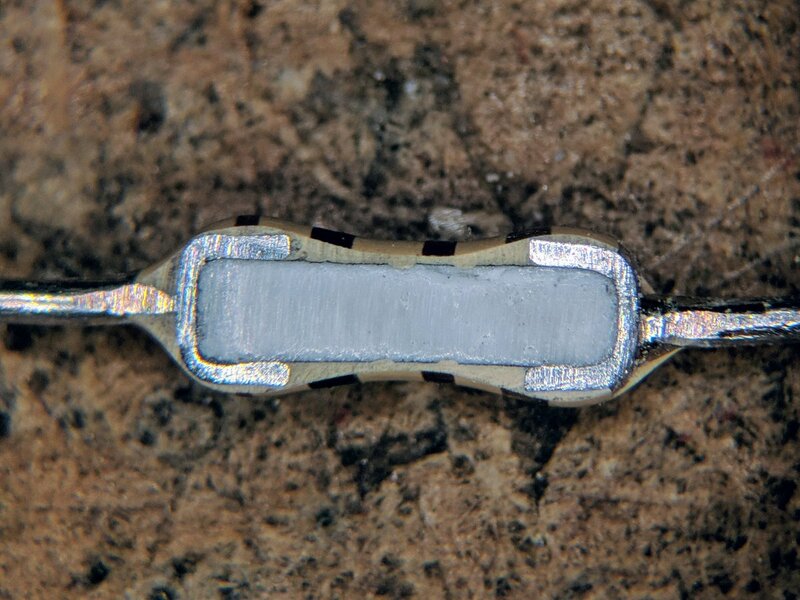 here’s the side view cross section of an Ethernet transformer. annotated version of the Ethernet transformer cross section. 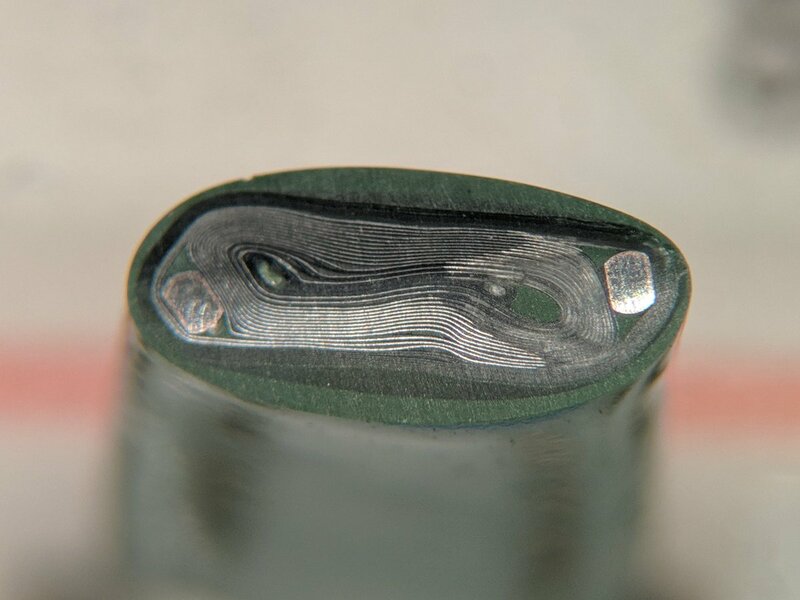 ok don’t try this one at home: this is a cross section of an LR44 alkaline button cell! 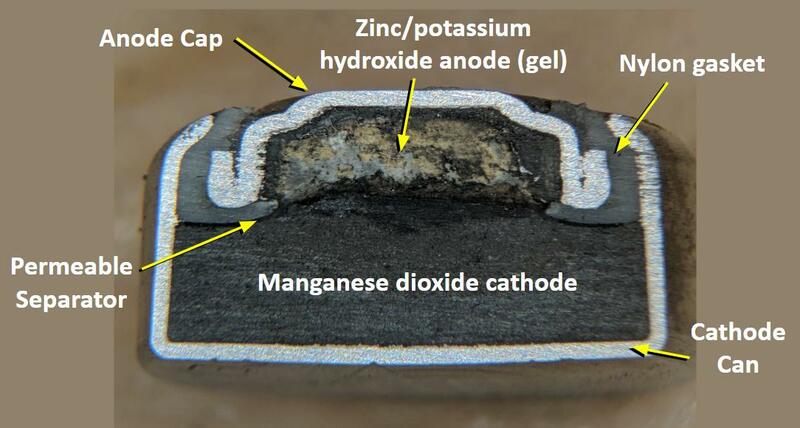 annotated cross section of the LR44 alkaline button cell.